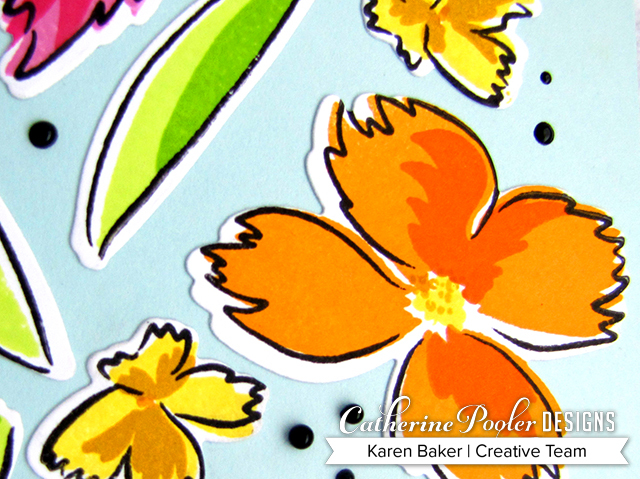 Wild and Wonderful indeed is the newest release from Catherine Pooler Designs! (affiliate links used) This collection features two new inks- Limoncello and Grape Crush, along with the now available Be Mine Ink, (All that Jazz Ink is included with these three, now known as the Party Collection: Carnivale Ink Bundle!). The Wild and Wonderful Collection also features two red rubber background stamps- Kaleidoscope and BFF, along with beautiful photopolymer stamps and Dies- Note of Thanks, Wonderful Wildflowers Stamps and Wonderful Wildflower Dies, Focus on the Good Floral Stamps and Focus on the Good Floral Dies and the beautiful Scroll Butterfly Die and In Flight Butterfly Die. I've got a few projects to showcase today for the last day of the blog hop-although all items are now available! My next card, I feel, is so grand and quite the showstopper when delivered by hand due to the 3-D nature! I started again with the amazing Ultra Smooth White Cardstock as a card base and then also cut a panel. Onto the panel, I inked a soft layer of It's a Girl Ink, and onto top of the panel I stamped the beautiful pattern from Kaleidoscope with Sauna Ink and stamped a sentiment from Note of Thanks. From this stamped panel, I die cut In Flight Butterfly Die, and then I die cut another butterfly and inked it up with Limoncello. I then inked some paper with Sauna Ink and die cut the Scroll Butterfly Die. These were adhered to the card at the body of the butterfly and the wings lifted for a nice 3D effect. One last card today for you! I started this one by inking an Ultra Smooth White Cardstock panel with Grape Crush, Sweet Sixteen and Royal Treatment Ink. 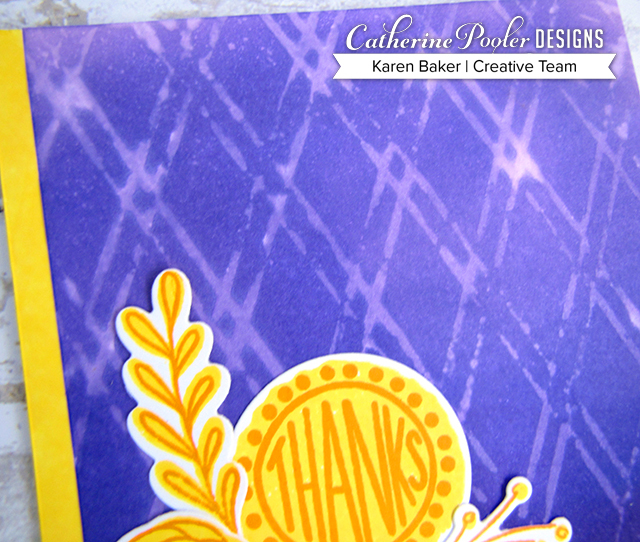 Then I watered the BFF Background Stamp with water, and pressed it onto the purple panel. This created a soft pattern onto the panel. I adhered this to a white card base, along with a strip of Limoncello colored paper. 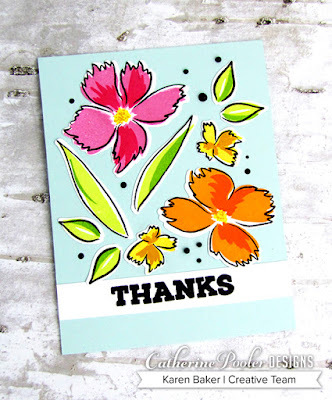 I added detail and a sentiment on the card using Note of Thanks, Focus on the Good Floral Stamps and Focus on the Good Floral Dies. The background color is Limoncello and the details stamped in Tiki Torch-what a great, bright and happy combination! Please be sure to hop and comment, as there are prizes! 5 random winners chosen to receive two free ink pads (and free shipping!) Winners will be announced on Catherine's blog, Friday, May 25. Gorgeous cards! They are all fabulous! Love that butterfly die! So many ways to use it.. The backgrounds are awesome too! Each card is amazing, Karen, and a perfect display of those wonderful new products! I had the opportunity to try the Catherine Pooler inks and I'm in love! Now all I have to do is figure out how to save up for them all! The watered stamp looks great! Must remember to try that one. 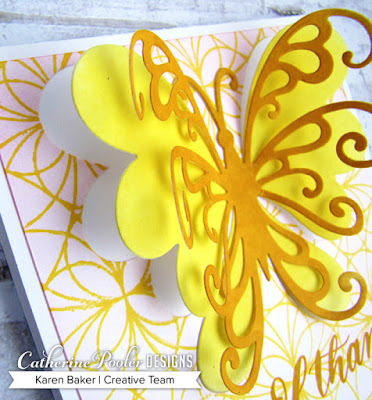 I can’t get enough of that butterfly and background stamp! Beautiful cards! card. Make a wonderful background. Beautiful cards. I love how you watered the BFF background stamp. It gave the card a unique look. Beautiful cards, Karen! I absolutely love the water stamped BFF background. So clever! Fantastic cards and so creative! I love purple and yellow together! That yellow butterfly card is so beautiful. The last card is so clever! I love the look that water stamping left! Thanks for sharing your creativity and talent with us! Beautiful cards. Great inspiration. Thank you! Awesome cards. The colors are amazing. Great cards! I love the colors you used on ALL of them. The die cut butterfly is beautiful! Loved how you used the BFF background and "softened" it! Fabulous cards. I’m really loving the new ink colors. They look great together. Love what you did with the BFF background stamp. Gorgeous cards, thank you so much for sharing your wonderful techniques. Got to love this butterfly die set. Wow! Your first card is stunning, love how those flowers pop off that blue sky background. Great cards! I especially liked how you water color styled the background on the last card! Wonderful cards! The flowers on the first one are so bright and vibrant. Love how you did the butterfly on the second one. Thanks for sharing. Loved the contrast of light blue background and vibrant wild flowers on first. And I liked especially the butterfly card. Wow! 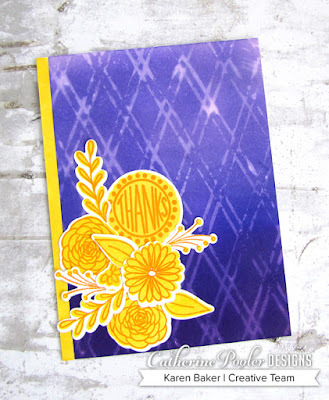 Love the bright flowers on the light blue background! All your cards are great! Fun cards! Thanks so much for sharing with us!! Beautiful cards! Love the flowers and the butterfly! Beautiful cards Karen! I love the color combo you chose for the first one. Gorgeous cards! Rich and vibrant colors. Fabulous inspiration of the new products. So pretty - love the vivid colors. All your 3 cards are fabulous !! I love your choice of colours. Wow! Awesome cards!!! Colours are amazing!!! Wonderful Wildflowers caught my eye! Great cards! Pretty and colorful variety of cards. Such pretty cards! love the butterflies! !